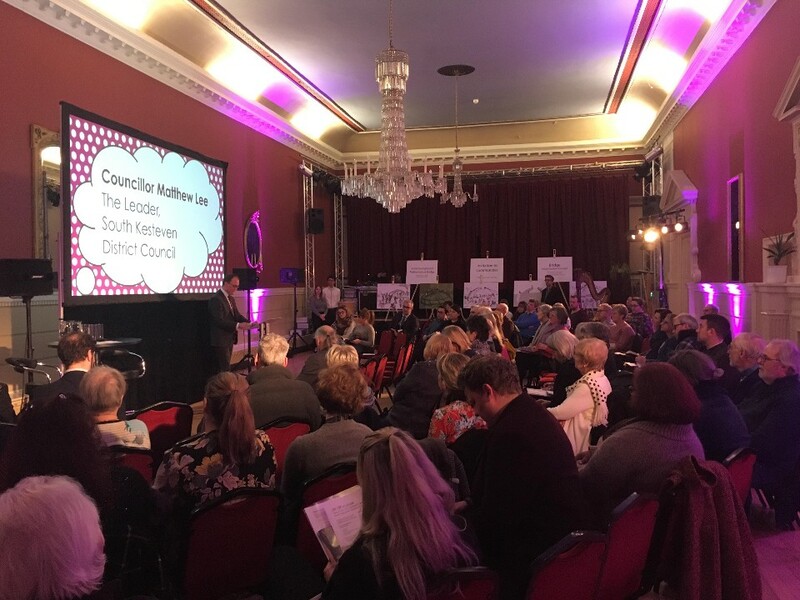 More than 60 people involved in the arts, heritage and cultural scene in South Kesteven attended the launch of a major engagement programme last week (23 January) to help develop a new cultural strategy for South Kesteven. The event in the Stamford Arts Centre ballroom was delivered by the district's regeneration company, InvestSK, and South Kesteven District Council and was the first of four events throughout the district, pulling together cultural organisations and creative artists to share their views and ideas on what the priorities, opportunities and challenges are they face. He said: "I was really pleased to see such a high turnout for the event, and so much passion from the audience. "It demonstrates what a vibrant cultural scene we already have in South Kesteven and, with the commitment and skills of people in the room, the clear potential there is to grow this even more. "Culture is a vital part of all our lives, and of South Kesteven's offer. It provides our residents with a great quality of life, it can inspire people to new learning and development opportunities, and it makes us an attractive location for people to move to. "It is also a crucial element of our economic growth, which is why I have tasked InvestSK, our growth and regeneration company, to lead on this programme. "We have bold ambitions for every aspect of South Kesteven, and I have always been clear that we will achieve those aspirations through collaboration with other partners. This cultural conversation invites all partners, right across the district, to play their part in shaping our future. "It's not about what we do as individual groups or organisations, it's about what we do together." Michael Cross, InvestSK's Head of Arts, spoke of the connections between heritage, the arts, sport and the sciences, and the opportunities to link them through festivals, buildings and facilities, information sharing, funding and expert advice. He said: "The Stamford Arts Centre is the perfect place to launch our strategy because we know how important culture is, not just to arts practitioners but also the whole community, and that's been proven tonight. "We're starting the engagement with those already delivering arts and heritage activities to understand their priorities, opportunities and challenges. As the strategy for culture begins to take shape we will undertake extensive consultation with the wider public so that they can really influence the way forward." The series of 'conversations' with cultural organisations and individuals will conclude on 12 February 2019. This will be followed by an online consultation, and the opportunity for other interested parties to feedback on Twitter using the #SKCulture2019 hashtag. Once responses have been collated and assessed, there will be further opportunities for residents to have their say at a range of public engagement events throughout March, April and May with a number of workshops and other events throughout South Kesteven.